It’s been two years since my Journey to the East (for which I’ve finally finished sorting the bulk of the photos. See my Journey to the East Index) and a couple of months back I’d began to feel the itch again. I began looking into trips I wanted to do and there were two that came to mind. I always regretted that I stopped my West Coast trip at San Francisco and I really wanted to do the entire Sierra-Cascades. Both of these routes are great but I found that what I really wanted to do was a ‘tour without a goal’. That is to say tour more organically without a big “get to east coast” or “go border to border”. Perhaps such an event will occur, perhaps not. I also have been really hankering to get into the mountains which seems like the ideal place to wander without much of a goal. Circumstances changed at my job and I found myself (happily) unemployed at the end of May. This left me plenty of time to get ready for a longer tour: downsizing stuff, getting new equipment, putting stuff in storage and basically arranging to be homeless for multiple months. I decided that I would use the Sierra-Cascades route as my framework: it would give me a lot of routes through the mountains, bring near many places I’d like to visit and also does have a start and endpoint I can use as I wish. So I got the maps that Adventure Cycling puts out but I also have the original version of this route, Pacific Crest Bicycle Trail by Bil Paul, which he wrote in the early 90s. This uses more off the beaten paths, side routes, forest roads and such than the ACA maps and between the two routes I should be able to spend so quality time in the mountains. 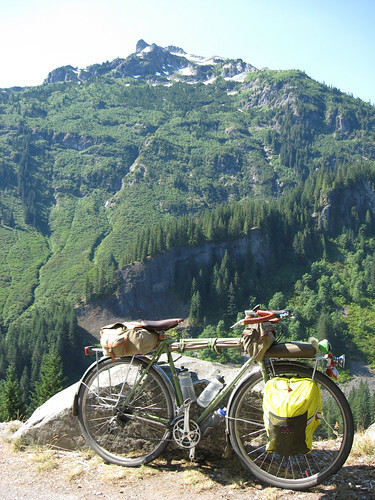 As I’ve noted in earlier posts I’ve wanted to hike the Pacific Crest Trail since I was a wee lad but since my heart turned toward cycling this is trip for me. I put all my stuff in storage and moved out of Seattle on June 30th. I’ve been staying with friends in Olympia for the last couple of days, but now, July 4th, 2014 I’m heading off on my trip to the mountains. I know from having done bits of this route before that phone and internet connections in the mountains are shaky. I’ll be posting blog posts here as I usually do, but will have to be catch as catch can. Thus posts may cover multiple days, or I may posts several days as I get a strong connection. We shall see how it goes, but I will be giving it the old college try. So keep an eye on this space if you want to follow along. I slept very poorly this night; I have to admit that stealth camping is perhaps not in my constitution. I got up basically at first light when there was still a few stars visible and Venus shiny brightly well into the early dawn. I quickly put everything away and then made breakfast savoring the last of my coffee. I hit the road and was immediately too cold. It was early (my earliest start ever) and I knew it was chill so I’d put on my leg warmers but not socks and was just wearing a long sleeved seer-sucker shirt. It was like an autumn morning here in the national park at 2000 feet and I was underdressed for it. There was fog across the road and streaming down the foothills and little traffic most of which was heading to The Mountain. I was passed by one car which then stopped a couple of hundred feet later as a herd of elk crossed right in front of it. A large buck with impressive horns waited at the back of the herd until all the does had crossed. I stopped at the first sign of civilization I’d seen, the little town of Ashford which is a base camp for mountain climbers. I drank coffee, put on warmer clothes and let my cell phone charge up. All around me was climbers discussing past and forthcoming ascents of The Mountain. The road had been gently downhill all the way so far and this would continue until I hit Alder Lake where it became rollers. 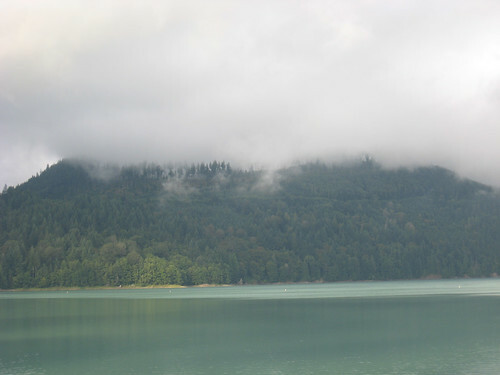 Alder Lake was a brilliant turquoise from glacier melt and with the fog rolling down the hills into it, incredibly beautiful. The road from the lake climbed out of the valley for a pace and then became rollers and then a long descent into Eatonville where I stopped to again warm up. It was still chill and there’d been a thick mist, almost like a light drizzle all along this road. Plus a second breakfast was in order. From Eatonville to Yelm the riding wasn’t much fun. On country roads through farmland and forest, but a lot of traffic and not much shoulder. Not to mention a headwind most of the time. 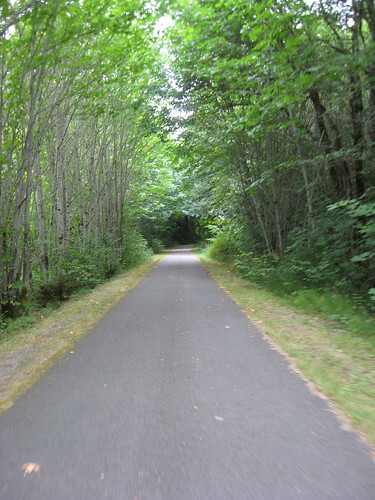 But at last I made it to Yelm and from there all the way to Olympia it was riding on rail trails. I tend to prefer a nice road to a rail trail, but I was tired and the roads here hadn’t been nice so this stretch was fine. 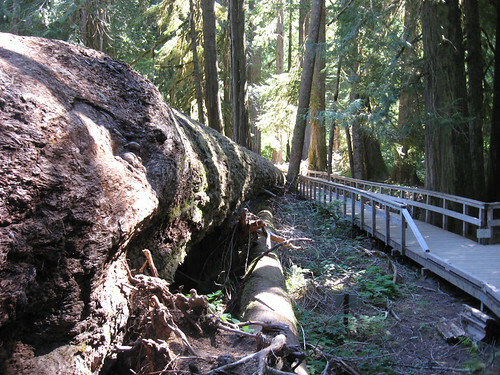 It began on the Yelm-Tenino Trail in which I traveled directly into the wind for 7 miles. 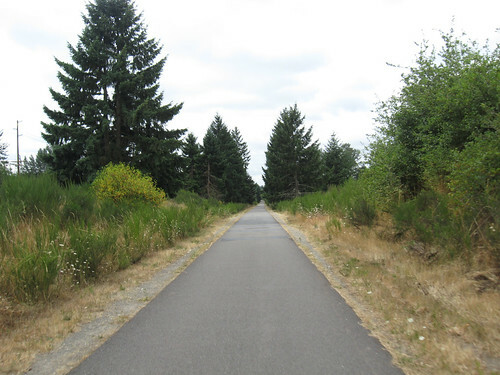 At an intersection I then jumped onto the Chehalis Western Trail which headed in to Lacey. This was now mostly out of the wind and following the currently active BNSF tracks mostly through woods. Absolutely nothing out here for about 14 miles but farms, pasture and eventually suburbia. It ended on the outskirts of Lacey and I rode city streets to an intersection with the last of the trails, the Woodland Trail (I should note that the Western Chelhalis Trail actually continues on and intersects itself with the Woodland Trail but the continuation after a street crossing was hard to find and I missed it). I’d ridden (and written about) this trail earlier in the month, but it is a nice ride though a wooded patch next to the I-5. It ends just a few blocks from where I was staying in Olympia so it was a simple route through nice neighborhood streets until I was finished. 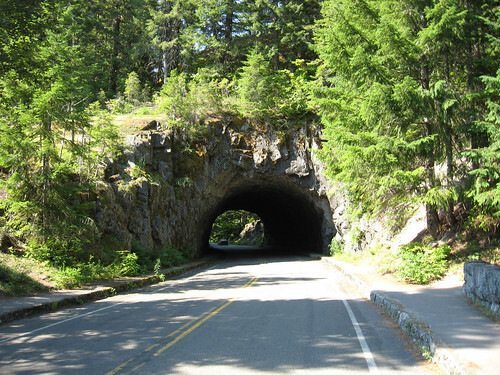 The ride up to Paradise is basically equivalent to another mountain pass – 4500, about 2500 feet of climbing from Ohanapecosh. As usually I wanted to hit the road early, especially as the park is crowded and the road up is a narrow two lane road without much of a shoulder. Alas it was not to be, various tasks, including needing to charge my phone a bit led to me leaving about at the normal time. The road was uphill immediately from the campground and barring a few flatter sections here and there would remain so for the next 9 miles. These first 9 miles were quite nice – it was cool, in the trees and not too much traffic. The views were beautiful, trees receding into mist, long forested valleys, foothills some with rocky summits and the occasional waterfall. At the 9 mile point though, I rounded a corner and there it was The Mountain. I hadn’t seen Rainier since that section of the ride to Ellensberg even though its presence looms over the entire National Park. It would be the most prominent feature of this ride, coming in and out of view all day and absolutely dominating at the summit. Just around the corner the mountain was fully in view and there was a large pullout. I stopped there for a break and to enjoy the view. Back on the road it descended for nearly 2 miles and then after a short tunnel began climb began in earnest. The road was now on the edge of the foothills with no shade and the late summer sun out in full force. The traffic was now steady with people leaving the campground, or heading up to Paradise. As I’d round the switchbacks The Mountain, ever larger, would hove into view. The other side was these three rock peaks with patches of snow on them. 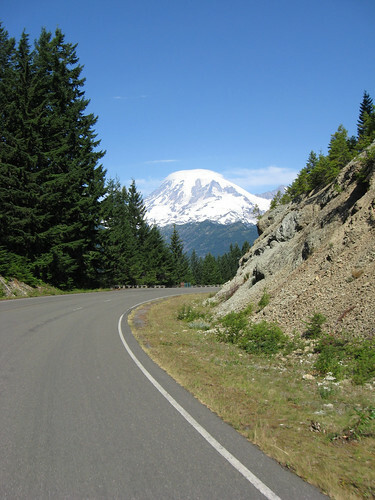 I could see the road winding above – mile long switchbacks crawling up the mountain. At 5 miles an hour you really get to linger on such sights. 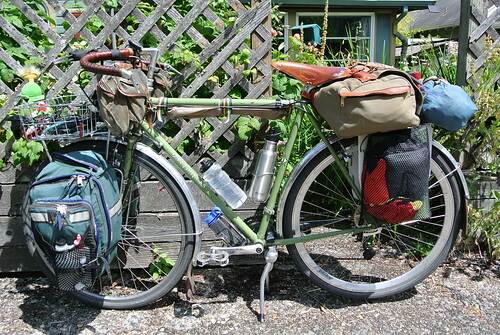 I was passed by a trio of roadies at one point, their unloaded bicycles allowing for a much more rapid ascent. The photo ops became so numerous it was only the attacks of the evil biting flies that’d keep my stops short. I was riding toward The Mountain now and it was truly awe-inspiring. The most beautiful perhaps being at the top of this “pass” Reflection Lake (4800′) which as the name implies is a small clear lake right in front of The Mountain. 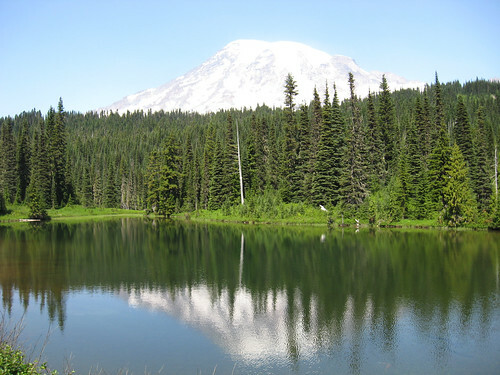 From Reflection Lake it was flat and then downhill for a bit, with again just overwhelming views of Mount Rainier. Then I reached an intersection of which going left would take me out of the park and right up to Paradise. 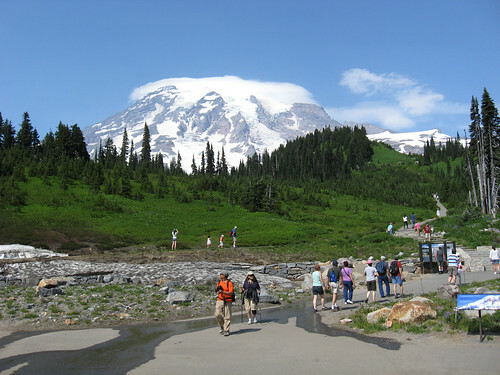 Paradise is the most popular place to go on the mountain and features a lodge, restaurants, the base for many of the mountain climbing attempts a bunch of trails, an alpine meadow and so on. I was really hankering for a real lunch and a beer so on up I went. This was less fun as the traffic was constant and it was of course a winding road uphill for several more miles. At last I made it though and bypassing the full parking lots rode right up to the lodge. The lodge was only doing Sunday Brunch and while I’d say one should be wary of offering all you can eat food to touring cyclists I have to say living off of food I can cook in one pot kept my trips to just a few. One thing that is really hard to carry when touring is fruit and vegetables so I always try to eat those when I go out and was the best part of the buffet. Well and the beer. Sateted I set out to explore Paradise but it was so crowded I really just did a cursory survey and headed out. The descent was good times: over twenty miles downhill. There was traffic but the road wound enough that I was able to keep up and use the pull outs to let them pass on straighter or flatter bits. 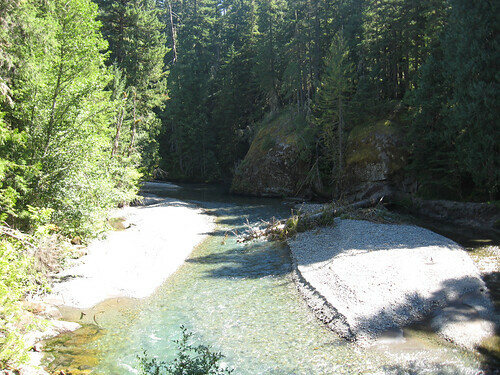 The trees came back and I was following the wide, shallow, rocky Nisqually river much of the time. At last it flattened out and I was fully in the woods. And then I rode through the entrance and was out of the park. Out of the park? I was supposed to camp at Sunshine Point Campground right near the entrance but still inside the park. I rode back in and slowly up the road seeing nothing. There was a stream crossing a mile in and I knew that was past it, so what gives? 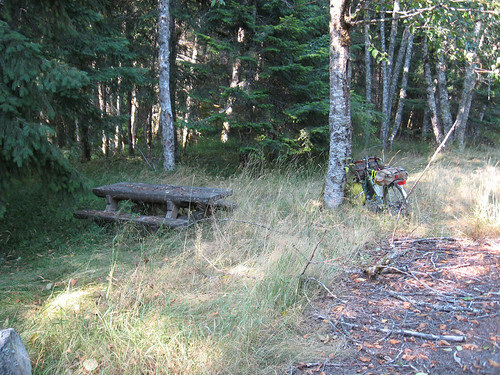 I very slowly rode back and about half way to the entrance I saw in the woods picnic tables. I pull off stashed my bicycle and walked to it. I had found the campground. 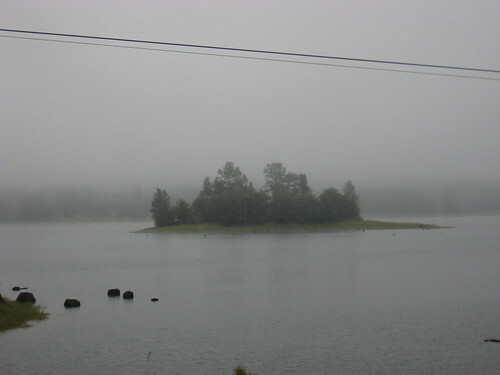 The flooded Nisqually had eaten nearly half of the campground with the road to its former entrance a jagged drop off. Perfect place to Stealth camp I decided. I found a site as far away from the rode and stashed my bicycle. I’m sure its some sort of federal crime to stealth camp in the park so I was pretty paranoid. I wandered around and read and basically killed time until dusk when I setup the tent and hung my food in the trees. Not being too much to do there I pretty much read and then hit the sack when it got dark. This day was technically a rest day, really the only day on this tour I spent without at least a little bicycling. I spent it hiking instead which actually tired me out just as much I think. It was a beautiful day, warm but comfortable enough inside the forests. As per tradition I won’t go into too much detail (plus hikes are sort of hard to describe anyway) but will put up a few more extra pictures. 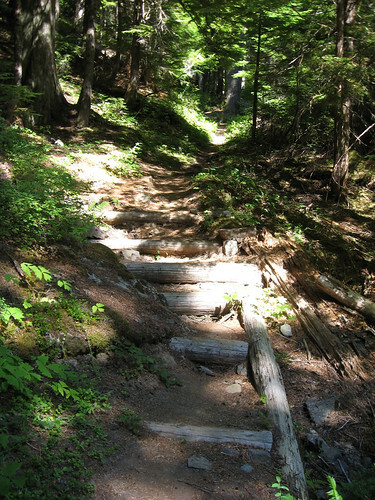 I basically did three hikes: the Silver Falls loop which I have to take to get to any of the other trails, the Grove of the Patriarchs which is a popular short hike with a parking lot and everything (including the water source I previously had to use) and then a section of the Cowlitz Divide trail. The Grove, being an easy and popular destination was not really my kind of hiking: too crowded, too worn down and sort of park-lite. 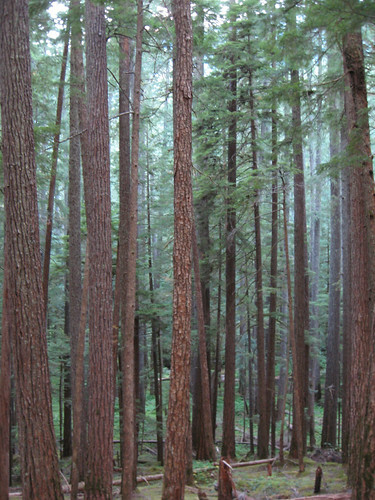 There was impressive trees here and it was quick enough so worth it, but not my favorite bit of the park.I checked out a couple trails that I could easily get too and most of them were too long. At least for their destination, obviously I could just hike up a ways on any trail. 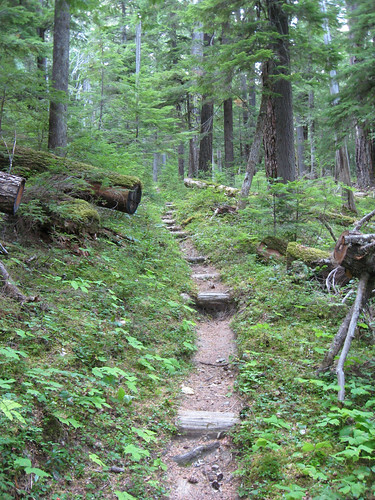 But it’s nice to have a destination so I ended up hiking a section of the Cowlitz Divide trail. 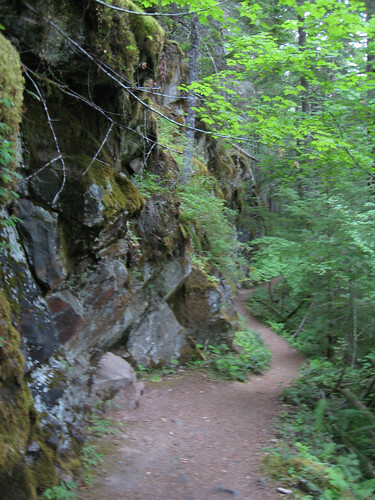 This trail had several destinations all about 2.5 miles apart. It turned out to be uphill the entire time I was on it. I saw no people for most of the time I was on my way up until I finally ran into a couple of guys and their kids who were heading up to the Ollalie Creek Campsite for an overnighter. This turned out to be as far as I’d go, as I was feeling pretty beat by the time I reached the creek. It was nice and cool at the creek, so I rested there, ate my lunch then headed back down. On my way down I ran into a lot more people most of whom asked me how far it was to the creek. A rather shocking number of these people were carrying nothing, not even water. After these hikes, which totaled up to 10-11 miles I was really wiped out and spent the rest of the afternoon and evening resting and wandering around closer to the campground. A good day though with some really nice and varied hikes. 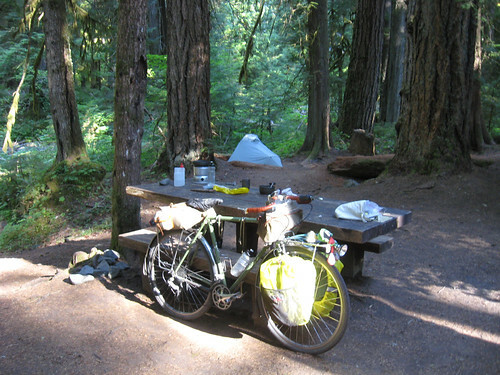 There was indeed no internet or even phone access until I was half back to Olympia on the final day of the tour. 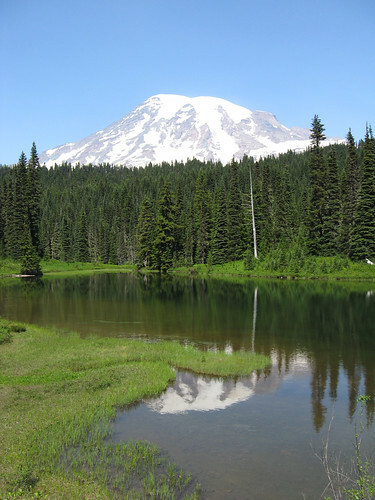 I spent day 14 and 15 in Mount Rainier hiking around and taking a bit of time away from the bicycle. 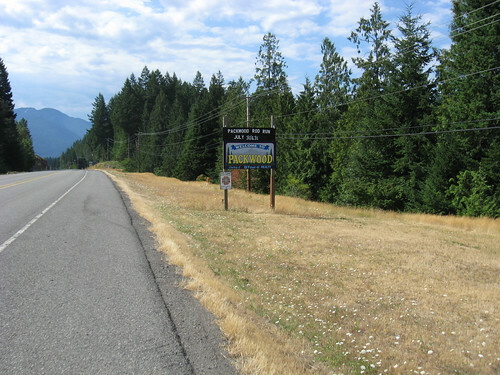 However on day 14 I had to ride down to Packwood to get supplies. This small town was 12 miles downhill from the campground so I did end up with a moderate amount of riding on that day anyway. I shopped, used WiFi (still no phone access in Packwood), went out to lunch and explored the town a bit. The big question at this point was could I stay in the campground with its broken water main. Before I’d left I’d just paid for another day and put the ticket on my campsite as you normally do. When I returned would they harass me about this? I suspected not, that once I was in they wouldn’t really care. The ride back was in the heat of the day and almost all uphill, but there was a pretty stiff tailwind and of course my bicycle was mostly unloaded so it wasn’t so back. As I pulled into the campsite they were indeed stopping people as they went in but I just rode on in ignoring them. When I got to my campsite they had marked my new ticket with my departure date which is the sign that they’d checked out you and registered you so to speak. So I was all good. About a half an hour later I noticed that people were coming in, in droves and it was clear that the campground was open again. Nice, no more hiking for water. So instead I went hiking for pleasure. But before I set out for that, while I was at the local river stashing a beer another touron pulled up. He asked if I was a touring cyclist and when I assented he asked if we could split the site. I agreed and he moved on in. He turned out to be from Portland and on a week long tour around Rainier and the local passes before riding back there. He had however down major tours including a three year long tour of Europe, North Africa, Tibet and so on. Good guy. After he set up we both set off hiking on opposite sides of the Silver Falls loop. 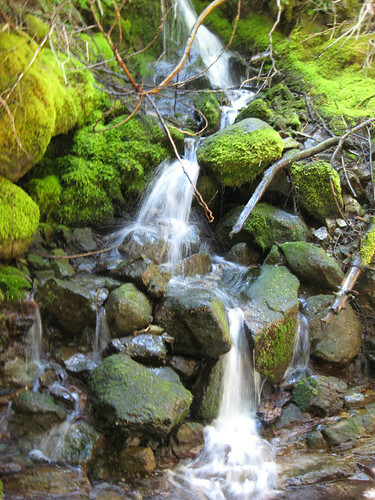 I’d done half of the Silver Falls loop the day before on my way for water so this time I took the opposite path and this time really enjoying the hike as opposed to portering water. Really nice walk through the woods, up a bit of hill. Of course it ended at Silver Falls and I ended up just taking the rest of the loop. 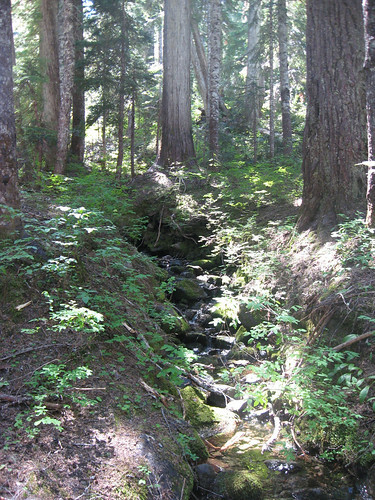 At the end toward the campground there is a hot springs and nature trail so I also explored those a bit. 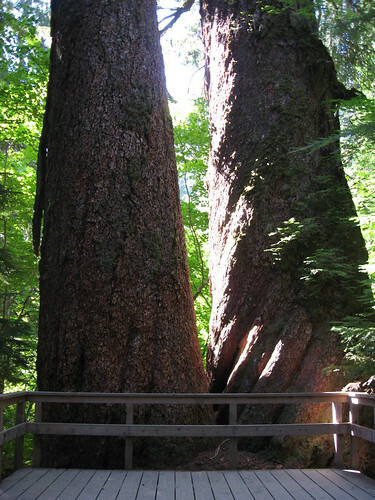 Not too epic hiking but along with the trip to Packwood, it’d been a nice day of activity. The next day would be all hiking and no bicycling. I again set off early in an attempt to beat the heat across the pass. Also there was the wildcard of the roadwork to contend with. It was overcast and cool and a headwind greeted me as I hit the road. The riding was fairly easy apart From the headwind with only a gentle incline for the most part. I passed several more basically empty campgrounds, so it looks like i would have had options if Windy Point had been full. Everything flattened out at Rimrock Lake and there was also several stores that I utilized to stock up for the climb and potential delays. I also replaced the horribly rusty water from the campground with store bought (which is an expense I usually try to avoid. It was a good long flat section along the lake and as the clouds broke up stunning reflections were revealed in it. Eventually the road turned upwards and the level of hysteria w/r/t the roadwork reached a fever pitch. After climb for s couple of miles I reached a a short back up if cars and the flagger just as the pilot car arrived. They insisted I load my bicycle into their pickup and ride with them through the construction. I demurred but they said it went safe so I went along. Only about 1.5 miles and then I was back climbing again for another 5 or so. Post the roadwork the pavement was in great shape and there was little traffic (there had been trucks for the construction about every 5 minutes going up). I took it easy stopping to view waterfalls and lakes as I went. The road was always uphill but never much of a grade. And then I reached the summit. Really the easiest of the passes even without the short ride in the pilot car. The Pacific Crest Trail crossed the pass as well and there was a store up there where thru-hikers could get packages sent. 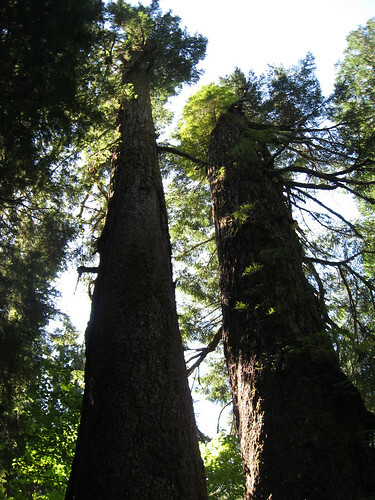 I ate my lunch outside the store and talked to a south to north hiker for a bit. His package was filled with Baby Ruths and sports pages. He was in the last section of his three month hike, quite impressive and puts it all into perspective. It was all downhill from here and St first it was a blast, but then I hit grooved pavement as they prepped the road for paving. Thus slowed me down but was still easy enough. Then another lime if cars and a flagger. Again I had to ride in the pilot car this time about 6 miles. This was downhill but grooved rhe rule way do not much if a loss. The lady driving really whipped through it leaving the RVs and trucks following far behind. It was about quitting time and it showed. Back on the bicycle it was a short downhill ride to the turnoff to Mount Rainier National Park. It was early enough that I decided to go for it (there is another NP just down the road I was heading got if the park was full). It was uphill in the sun for 4 miles into the park but at last I was there. At the entrance to the Campground a ranger there informed me it was closed due to a water main failure. I talked to him a bit and eventually talked him into letting me stay (they were letting people with reservations in do it was far from empty). Water would be a problem though but he told me there was a drinking fountain a mile away. So again things worked out. But I really needed to stay here for a few days as camping within riding range will be tough over the weekend. Will it all work out? Stay tuned! I made full use of the hotel, it’s laundry, it’s free breakfast, WiFi and power. Hence I ended up on the road later than I have of late. This was unfortunate as it was a scorcher, the hottest day yet. The first part of the ride was the best, through the Yakima River Canyon. Steep walls, carved out by the river with striations of color and odd textures. Some parts of the canyon walls looked eaten out like soapstone on a massive scale. The Yakima was there the whole time and fairly active. Along with the symphony of the senses I described the other day, there are also many great smells from time to time: mesquite, sage and I’d swear rosemary. Every do often it’d roll over you as if you riding through an herb garden. The route wasn’t flat and there were a couple of good climbs in the middle and a long one at the end. The route skirted Yakima so I left the route for a short time a Selah to get lunch. It was really got now and the route climb a bunch to get out of the valley and into the next one. This was perhaps the most barren section of the tour yet. 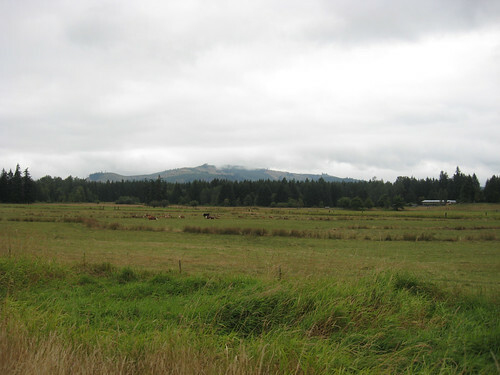 There was pastureland for a bit but just past it’s artificial greenery was just dead looking scrub. The route turned away and then there was no green just tan everywhere. It was deadly hot now, the hottest yet. Then the route climb and climbed until I was in the hills above Nachas. There was a crazy descent down switchbacks and I was in this little town. I hit the store and pressed on. I was taking another gamble here – I’d ridden about 50 miles at this point and was nearly done in with the heat. Yet the closest sure campground was back up that crazy descent. Plus it was miles of route from there. I climb White Pass tomorrow and wanted to be part way up (as has been my strategy on all the passes) and there are several campgrounds but the guide claims they are all reservation only. But looking at the NSF website there seems to be walk on sites. So I go for it. I figure I’ll camp next to the river if they are full. At the beginning of the river Valley up White Pass I was stopped by flagged who told me that roadwork was causing delays about 25 miles ahead. I knew that I would hit that today so pressed on. Something to look forward to for tomorrow. Thin clouds had rolled in and it was cooler when they’d block the sun but ad I went up the valley trees and the wakes would provide real relief. There was fishing spots all over which I figured at camp at if things didn’t work out. However they did and Windy Point Campground only had three sites filled (though a lot were reserved for Labor Day Weekend). So again it worked out, hopefully that’ll be the case at Rainier as well. Today I climbed the second pass of the tour and in light of this I again rose early to try to beat the heat. It was looking to be yet another hot day with blue skies with only traces of cloud. 97 was pretty easy going for the first 7 miles or so though iit was primarily uphill all that time. At that point I took Old Blewit Road which is winding, empty and in the trees most of the way. The roadway was deteriorated in parts, strewn with rocks and overgrown as well. 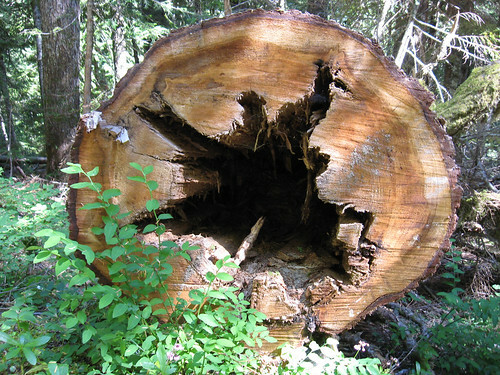 But the trees blocked the sun most of the time and I never saw a car – it was like a bicycle trail over a pass. I did see prospector camps and a genuine old grizzled prospector who asked me if I was having fun yet. down below summer holds fast. Of course it still climbed a lot, continuously for 4 miles or so, but all in all I was happy to reach the pass at 4064 feet. From there it was an equally winding beaten down road for a 4 mile descent. This demanding a certain amount of caution but once it rejoined the 97 I was able to really let her fly. After miles of descending there was an additional 2 mile climb at the top of which was a windmill farm. It was breezy now and hot as well. But after that climb it was downhill into the college town of Ellensburg. The camping options were poor in the area and weary from the climb and heat I went for a motel for this night. This I had plenty of time to wander around the city. Eventfully I made my way to the Iron Horse Brewery and sampled their wares. Monday 08.22.112: Lake Chelan State Park to Blu-Shastin RV Park and Campground. I did a lot of riding today and it was rather a mixed bag. 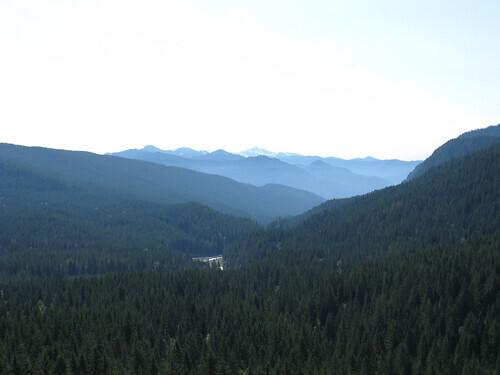 The route from Lake Chelan State Park immediately climbed for a mile and a half but after that it descended into this truly excellent forested valley. It was cool in there and it wad good to be riding in trees again. Of course it didn’t last and I was back in the scrub again, still in a valley it just now had towering walls of dry grassland. I should say that the seemingly relentless shades of brown and tan shrubbery is not at all boring. The eye is captivated by the subtle complexity of the patterns formed by the variance in color, shadows and the things that stand out. 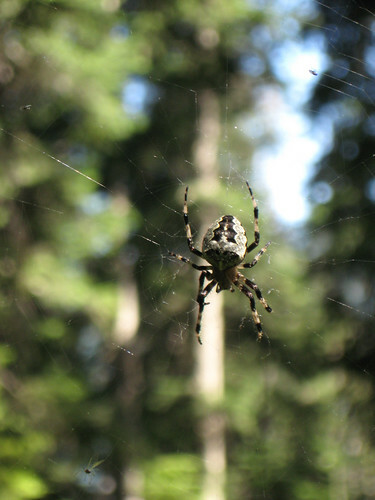 There are also many interesting sounds: grasshoppers, crickets and thus rattling insect, brooks, streams and rivers, wind in the grass and shrubs, sprinklers, windmills and the rattling of metal and on and on. It is a different beauty from Western Washington but it is definitely captivating. again brought humidity but it definitely kept the heat down. Anyway it was slogging along on 97 until Wenatchee where I felt I needed a beer. So I fired up the Maps App and found two places. Alas I chose to go to the one that no longer exists. So I backtracked, including a section on a nice trail through a park and arrived at the Columbia Valley Brewey. Nice place, there were only a couple of us there and the bartender, of Irish extraction was trying to deal with his car having been hit in the parking lot by an out if town couple. They had given him some podunk Michigan insurance info and he was having a hell of a time dealing with the the voicemail system. a regular helped him out by googling the area code for the insurance accident line as they place was so podunk they didn’t feel they’d need to include that info. Good times and seemed like a good bunch. I enjoyed the beer too. I now had a bit of a conundrum: there was camping where I was in Wenatchee or about 30 miles away. It was early and I’d only ridden 30-40 miles so I went for the distance. This was a slog, back in the headwind on US 2 for a bit which was busy and not much fun. The clouds were thick now and there was actually a few drops of rain (which I relished). Eventually it was off the freeway at the small town of Cashmere (home of Aplets and Cotlets). The route took hilly backroads for a while peaking at Deadman’s Hill. This was one of the steepest climbs to date if not too long. I guess you’d expect no less from a place called Deadman’s hill. From there the road dive-bombed back into the valley and it was back on the 97 toward Blewet Pass. This bit was tough – I was definitely burnt out, the headwind had become strong with occasional big gusts and it was uphill (mostly gently) the whole way as it is the start of a pass. It was otherwise nice, on a river and there is now greenery again that isn’t the direct result of watering. Anyway I was happy to reach this RV place I’m staying at even if it is an RV place. I’m camped right on the river and it’s soothing white noise is putting me to sleep..